Is it a bird, is it a plane, or is it the first commercially successful superhero film? 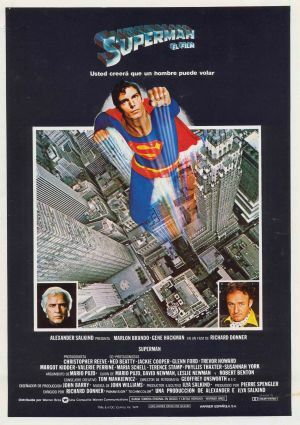 It could be said Superman: The Movie is quintessential of the genre due to a few key aspects. The film introduces newcomers to the story of Superman with a simplified but quick paced introduction to Superman’s home world, Krypton and its destruction. Marlon Brando is excellent as Superman’s father, calmly teaching a baby Superman all knowledge in a beautiful scene of fantastical lighting, reminiscent of 2001: A Space Odyssey’s epic journey through space. The film captures the innocence of comic books and the good will of Superman, and is shown off gloriously by the John Williams soundtrack most noticeably in good-hearted action sequences and the Superman and Lois ‘flying-date’. For a film released in 1978, the special effects are almost unbelievable; a scene where Clark runs alongside a train appears like it was produced today as do a lot of the flying sequences – a credit to director Richard Donner. For a film of this quality it’s surprising the superhero genre took over twenty years to become a major player in Hollywood. Superman: The Movie mixes humility, comedy and action-thrill standing as a Superhero film with so much more to offer than almost all latter day releases.